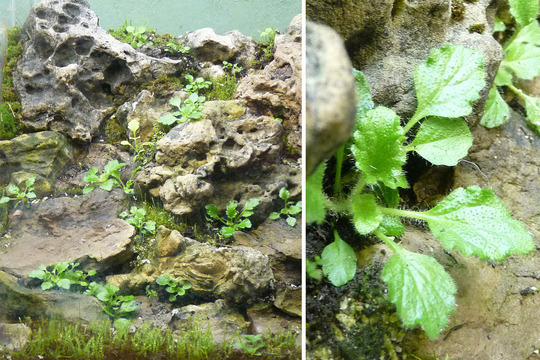 Through the pages of many excellent alpine and/or rock garden club publications, newsletters, and of course internet postings, we get to see a lot of fantastic rockeries, many of which are realistic models of what our plants might be growing in if they were in their natural habitat. The best examples are constructed with one kind of rock, and most often this is purchased stone, which can be quite expensive. 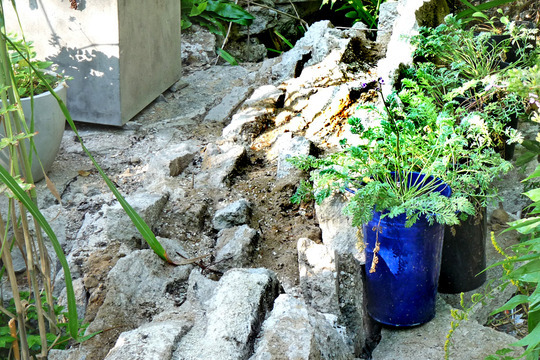 I’ve never had the budget to do that, so my rockeries have been built with what I can find and scrounge. Some are made with mixed ‘road rocks’ and boulders that I was able to dig from the back of the property. 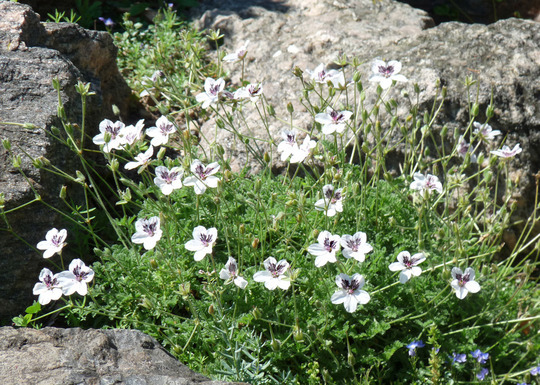 My favourite rockeries are crafted with only limestone that has been collected over many years, and these tend to house my favourite erodiums and rarer alpine geraniums. I have been surprised how many erodiums have proved hardy here in central Ontario. 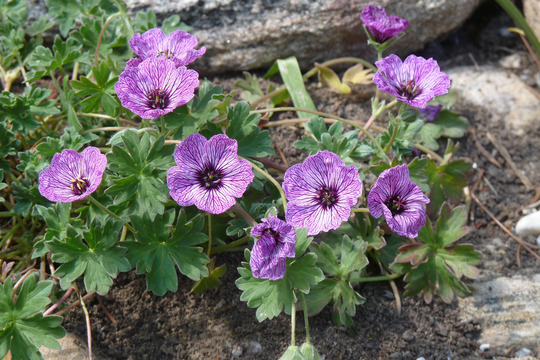 One of the hardiest is Erodium manescavii, and it is an erodium that is fairly well-known. I have also found E. acaule, E. cheilanthifolium (seen above), and the popular (male only) E. chrysanthum hybrid ‘Moonman’ (seen below) to have survived in my rockeries for several years. 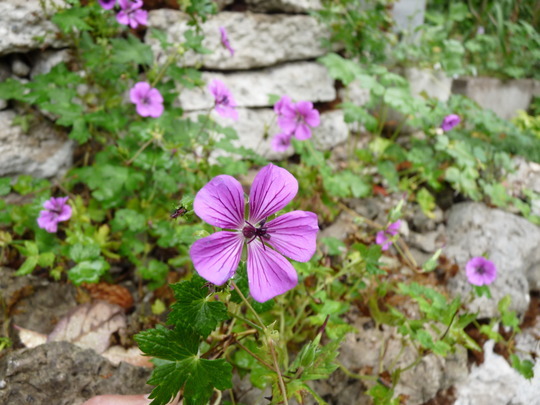 Also planted in prime locations are hardy geraniums that have their background in alpine conditions, such as Geranium farreri, G. argenteum, and the various G. cinereum varieties. I’m not one to pass up an opportunity to acquire more rock or even broken concrete for that matter. 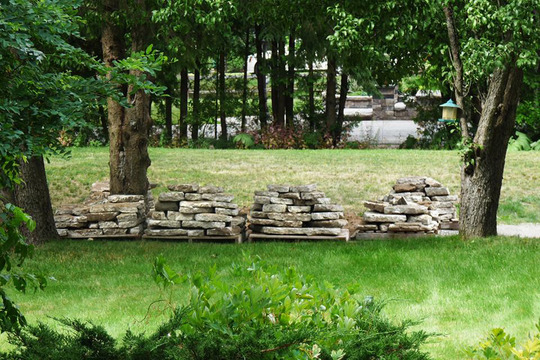 I have made wonderful natural looking walkways through my rock gardens using pieces of a neighbour’s old sidewalk when they replaced it a couple years back (below). You can just imagine my excitement last summer when a house just a few doors down ripped up an old cement patio and piled the rubble out in their driveway! 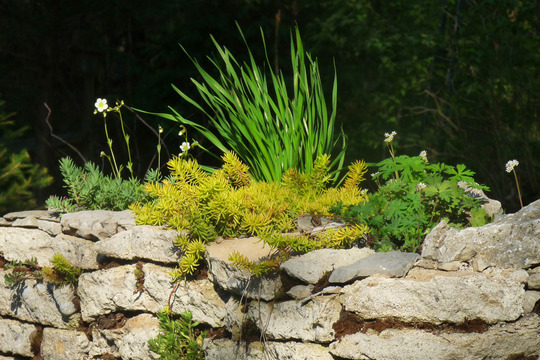 We have read in the various publications that larger public gardens have been making use of concrete slabs (Urbanite) to create large crevice gardens. Some heavy equipment is usually required for this, but on a smaller scale the backyard gardener can create something useful with nothing more than a sledge hammer and a two-wheel hand dolly! 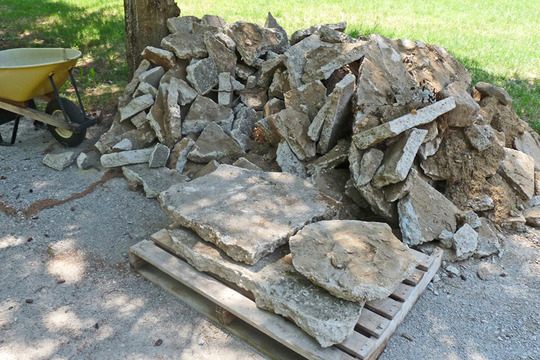 They were quite happy to let me have the rubble, since it would have been quite a cost to have it disposed of. I prepared myself for many trips with the wheelbarrow once I got it all smashed down to manageable sizes with a sledge hammer. The fellow doing the work was so happy to have the pile gone, that he offered to run it up to my place with his forklift if I piled it all on skids/pallets. You don’t have to tell me twice… I soon had it all sized and piled, filling 6 skids! This was naturally during the hottest portion of that summers record heat wave. I had an area in mind for this new outcrop… It would be along a garden path, under a tall Blue Spruce that had been trimmed way up. Not much was growing there, and the spot had become taken over by ditch lilies and comfrey. A little site prep was required, removing what I could of weeds and laying down lots of cardboard and paper as a weed barrier. The basic design was going to be a curved (along the path) raised bed with another smaller raised bed in the centre. The centre walls would have to start at the same foundation level to prevent it eventually sinking down into the larger bed. Although six skids sounds like a lot of concrete, it does not go as far as one might think… I’m sure this is well known to those who purchase stone! 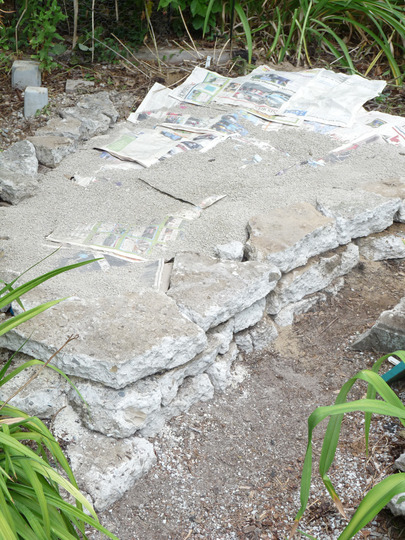 For the lower foundation courses of the inner wall I used a lot of old brick and interlock pavers, to save on using my limestone-like concrete. The bottom half of the inner structure would be buried by the outer bed and would never be seen anyway. I started filling up the outer ring with wonderful golden sand, easily dug from another area… Our property sits on an ancient sand dune in which in most areas is only 12 inches below our top-soil. Special tools or heavy equipment was not required for this project. The most important tool was the sledge hammer, which allowed me to get the few really big slabs into a size that could go on the skids. Needless to say safety glasses and work gloves are a must (above left). 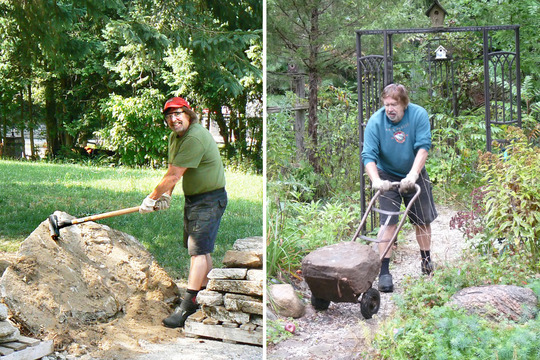 Getting the pieces from the skids on the driveway to the site involved what I call my ‘two wheelie’, a sturdy hand truck, which has been used many times for hauling rocks that I dig up in the back forty (above right). 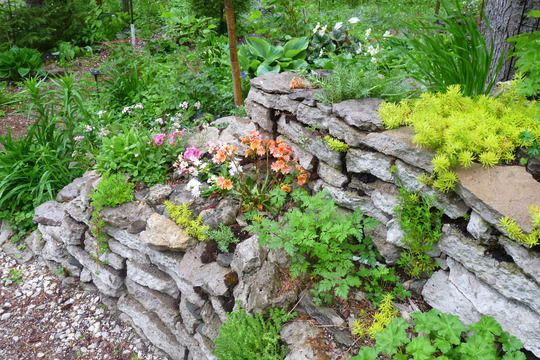 My original granite rockery built with rocks dug from the back yard. 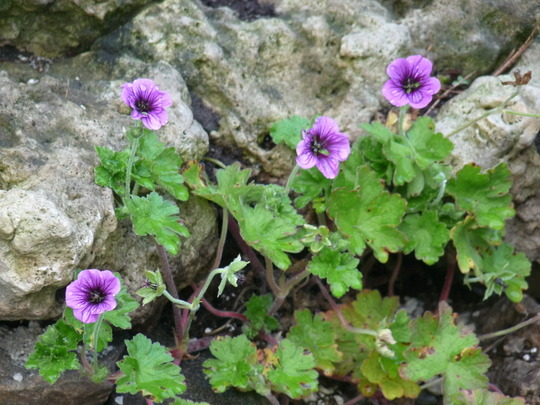 This rockery housed a lot of Geranium sanguineum cultivars. They have thrived here for years! Getting back to that latest project… Although not as needed for building wall-type rockeries my extra long crowbar also came in handy for shifting larger sections. It also helped in levering big pieces onto the two wheelie. 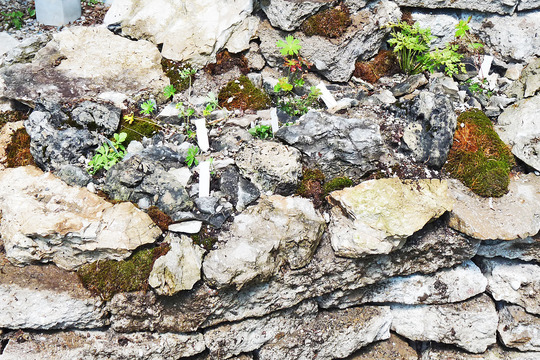 This new ‘out crop’ (my name to differentiate it from other rockeries) would not appear as a vertical crevice garden, hidden below the eventual surface scree of the first ledge were vertical pieces of mortar and brick (above) to create the same benefits for root growth. Although mostly filled with sand, I did add areas of nutrient rich compost for the roots to grow down into. This layer of compost would be laid down just below those vertical pieces being added in above photo. There would be sand below and sand with some crushed limestone added above the compost. Good drainage is important, but I still wanted a layer that would hold some moisture, as the location is sunny and dry (due to that big spruce above). Not all my plants will be true alpines and this little bit of moisture retention and nutrient will help them without hurting the true alpines that like a tight, sparse substrate. 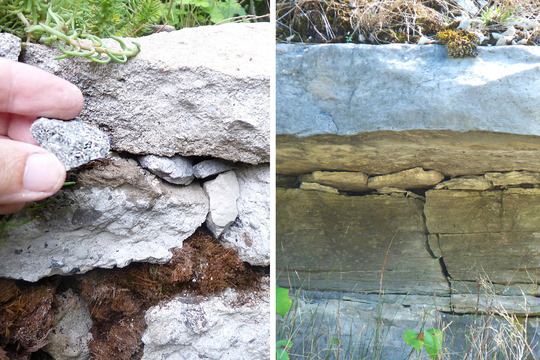 All too often, the novice rock gardener will not be aware of the benefits of the rock structures that are buried for the root growth. 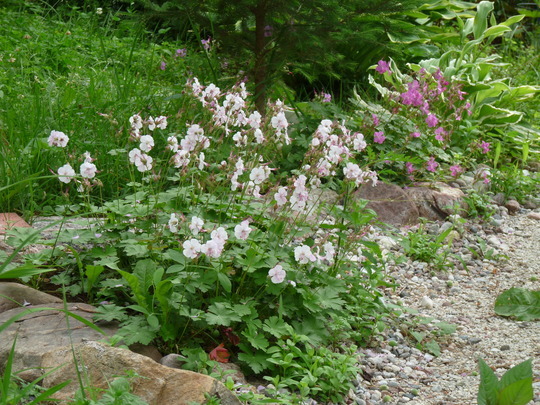 A few rocks scattered among your plants does not make a real rock garden. 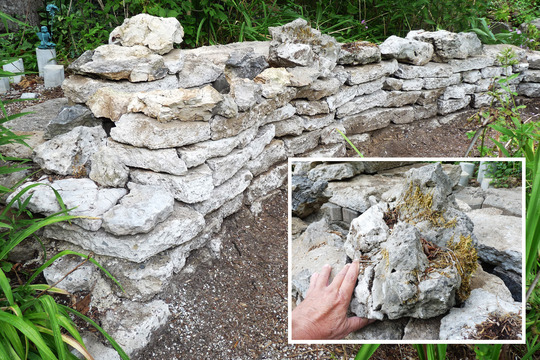 As I approached the top row for both the outer and inner walls, I dressed them with real limestone rock that was the same grey colouration as the concrete, adding to the illusion that the concrete wall might be a limestone cliff. This was more of a challenge to fit these together in a natural way, than the laying of the fairly straight forward slabs. Perhaps not all that convincing before planting, but once there are some trailing plants, some sedums tucked in here and there, and some of the cracks caulked with moss (sun loving moss from my garage roof), it will take on a far more natural appearance. 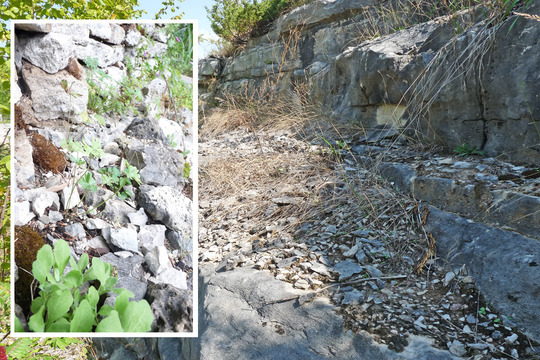 Once the walls were topped with the real rock, the ledge around the structure and the very top of the upper raised section were covered with limestone scree inspired by the scree seen on natural cliff ledges in the area. Now I am not the purist alpine gardener, growing only the most sought after alpines… I don’t grow those perfect mounded cushions. 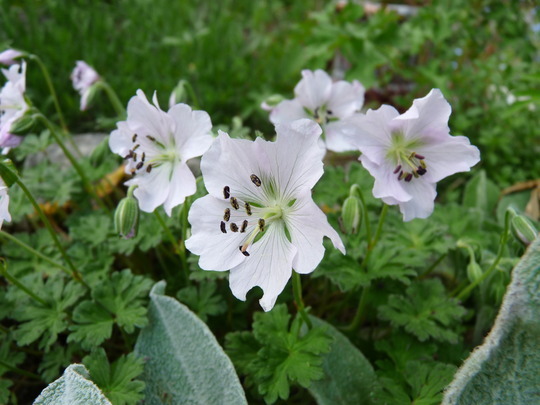 My main interest is in hardy geraniums and erodiums, and I had plenty of alpine-type geraniums and erodiums waiting in pots for the out crop to be finished. Most of these are plants that were grown from various club seed distributions. 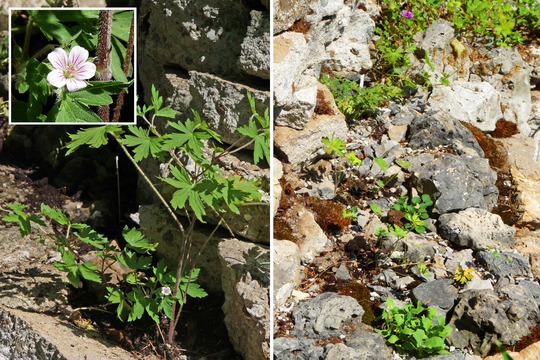 At the left above, is Geranium sibericum (a somewhat weedy species) that liked scrambling down the rockery. 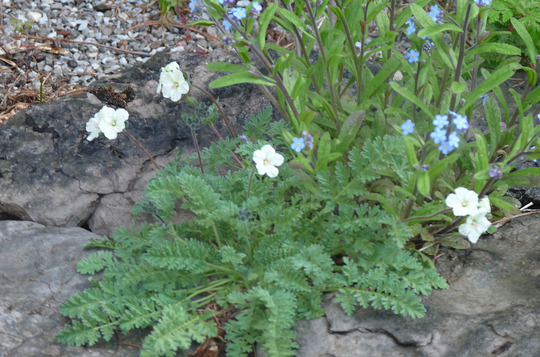 My rockeries include a lot of plants that would not be considered rock garden plants by many standards, but yet they thrive taking advantage of the good drainage but yet enjoying the retention of cool moisture under the rocks, even if at first that sounds like a contradiction. Every year I do get more adventurous and order more true alpines to experiment with. It is good that most clubs are very inclusive for those of us that also grow a lot of other shrubs and perennials. 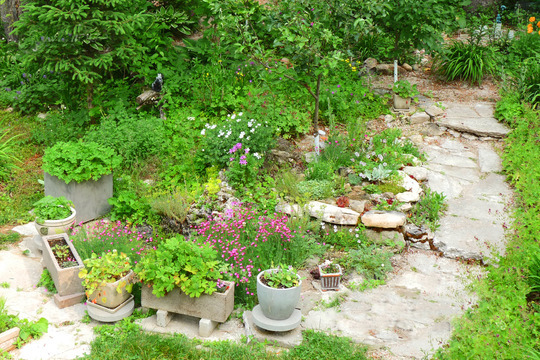 After all, those beds of daylilies and hostas provide a great backdrop for the rock gardens. Once my initial seedling planting was done, I could fiddle with some cosmetic details to help naturalize the appearance. Some moss was calked into some spaces, a few sedums and sempervivums were added to spots on the wall, as well as stuffing in some of the concrete scree (above left) that I created by smashing up the large slabs. Again, these small pieces mimic the limestone cliffs that I’m always exploring in this region (above right). On the shady backside of my out crop, I left an area flat, so I can place some pots or troughs there. And behind that I actually did a few exposed rows in a vertical style, but there was a reason for that… Right up against the last vertical row, I place pots of sun loving erodiums. The pots are in fact in the shade of the last row, so the potted plants get the light they require but the pots stay cooler! 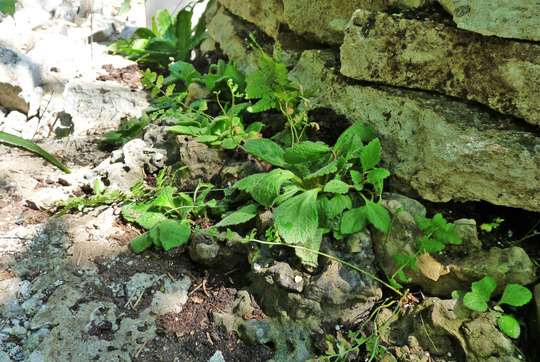 Also along the first ledge on the north side I have planted some hardy gesneriads (ramondas) that I have grown from seed… They came through the first Ontario winter (USDA zone 4) just fine in that location. This was actually their second winter, as the first was spent in a terrarium (seen above), as they had looked too tiny to put outside… They are such slow growers! There is good snow cover in our area for most of the winter, and the early spring sun warms the rocks. I did worry a little when this happened and the rockery was bare long before the rest of the garden. Not a problem, I soon was to see signs that all my plants had survived and now I was ready to add even more! I’m the kind of gardener that can’t leave a space unplanted… My out crop is now a jungle like the rest of my gardens, rockery or otherwise. 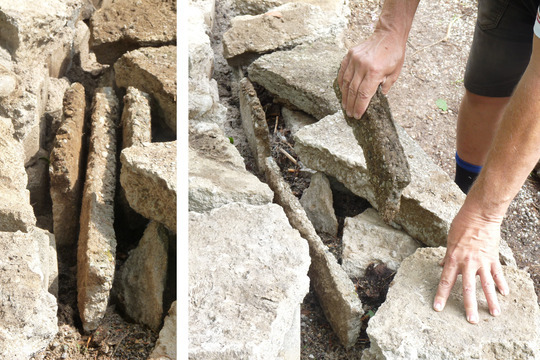 The neighbours came by to see what had become of their old patio… I have so many plants there that they could not believe that I had used all the rubble! Hmmm, maybe I should call it ‘Rubble Ridge’? 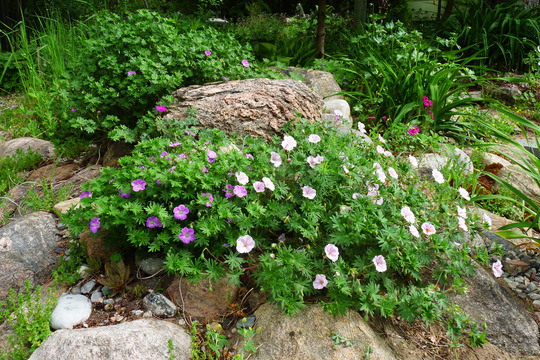 A Geranium wallichianum enjoying life on the ridge. I’ll end this piece with a diagram that shows the better root growth I get from my erodiums and geraniums when they are in a rockery situation. They grow strong deep roots reaching down to the moisture and nutrients, instead of spreading in a shallow way near the surface. 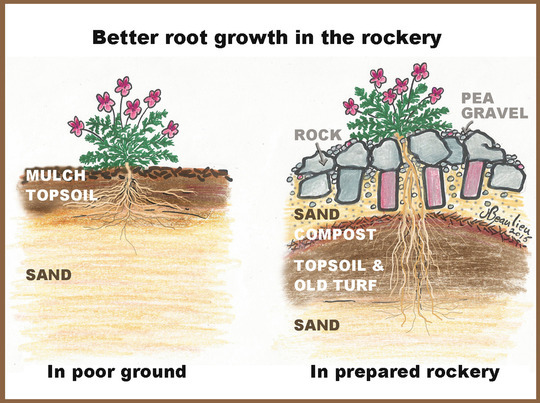 The shallow root growth can take a beating during times of drought or excess wet… The rockery protects them from extremes.